It's grant writing time here at the Paper Trail, which means reading lots of papers to cite in the background section of the grant. I'm going to cover my favourite paper that I've discovered, which shows that endocannabinoids can directly modulate taste receptors. Flavour is a tricky perception. It's obviously dominated by how things taste, but also influenced by olfaction, and internal states like hunger. Recordings from rat gustatory cortex show that other sensory modalities are represented as well, like sensorimotor information from the tongue, or temperature. While some of these modalities are directly encoded in cortex, others are represented indirectly, through hormones and neuromodulators. The most famous of these is leptin. Leptin is released by fat cells (adipose tissue), and is bound by leptin receptors in the hypothalamus and sweet taste bud cells (TBCs). Leptin is an anorexigenic mediator, which means it suppresses appetite. What's really cool is that leptin doesn't just act centrally: if you record from TBCs in mice, you'll find that leptin decreases the firing of sweet TBCs. In contrast to leptin, endocannabinoids are orexigenic mediators (appetite stimulants) that were known to work through CB1 receptors in the hypothalamus and forebrain. In the paper I'm covering today, Yoshida and colleagues showed that endocannabinoids (henceforward ECBs) can act orexigenically directly on sweet receptors themselves. They started by recording from the taste nerve innervating the anterior tongue. In wild type mice, the taste nerve responded to a variety of tastants, including NaCl, sucrose, quinine, etc (panel A, below). To see the effects of ECBs, they injected the endocannabinoid 2-AG i.p., and again recorded from the taste nerve and found that 2-AG increased the response to sweet tastants (panels A, B). They also tested the dose-dependence of 2-AG, and found it saturated at approximately 1mg/kg body weight. 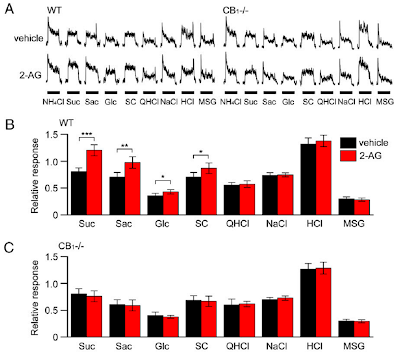 Endoannabinoids increase sweet response; CB1 -/- mice have no increase. From Yoshida et. al. 2010. Next they repeated the experiment in CB1 knockout mice, and found that the knockout mice had normal responses to all tastants. However, when they injected the ECBs, there was no increase in the sweet response. This shows that ECBs can enhance the sweet response, and that the CB1 receptors are essential for that modulation. To see the behavioural effects of ECBs, they measured how often the mice licked a liquid source. To make the task more interesting, they mixed quinine (a bitter tastant) with sucrose at different concentrations. At all the concentrations tested, the lick rate increased in mice injected with the ECBs. CB1 knockout mice, however, had no difference in lick rate. Next, to verify that ECBs work directly on TBCs, they isolated TBCs and recorded from them directly. They used a transgenic line that expressed GFP in sweet cells, under the promoter for T1r3 (expressed in umami cells as well). Using a glass microelectrode, they recorded extracellular action potentials from the isolated TBCs in response to sweet tastants (see below). Then they bath applied 2-AG and found that the firing rate increased in response to sweet tastants. 2-AG enhances TBC response to sweet tastants. They tested the response over a variety of concentrations, and found the EC50 for 2-AG was 0.1 ug/mL. They also verified the ECBs worked through the CB1 receptor by applying antagonists against CB1 and CB2. Only the CB1 antagonists were able to block the ECB enhancement. In the final figure of the paper, they performed RT-PCR and immunostaining to verify CB1 was present in sweet TBCs. It's amazing to me how often the brain seems to modulate in depth. There are endocannabinoid receptors on the tongue, and in the hypothalamus and forebrain. And it occurs across modulators as well, as leptin is expressed in all these places. While I jokingly titled the review "the munchies," the body expresses endogenous endocannabinoids, and these levels inversely correlate with leptin levels in the blood. And while the effects of endocannabinoids are obvious on the tongue, I don't think it is quite as clear in the brain. It would be interesting to record from gustatory cortex while animals were under the influence of endocannabinoids to see how the representation changes. You could sell it to the NIH under the drug addiction program.